My list of things to do over winter break included reading and preparing for class next semester, getting through “Catch-22“ and a few other books for my own sake, taking the Jeopardy contestant test, studying for the GRE, and catch up on game reviews so I could post more frequently than once per week. What did I actually accomplish over the last six weeks? Minecraft. Often for four or more hours per night. Now, nursing an addiction for a video game could easily sound like praise, but with that logic you might say that watching someone do heroin for ten years would offer a sparkling endorsement of opioids. Likewise, I don’t want to compare Minecraft to drug use, although it did have a tendency to leave me looking like I hadn’t eaten or slept in a week. Rather, picture a combination of Fallout, Final Fantasy XII and Legos. I’ll start with the obvious comparison. Like many others my age, I spent an inordinate amount of time learning my ineptitude at engineering through these plastic Danish building blocks. My creations, subject to the terrors of my grand imagination, grew larger and more complex as the weeks went on until gravity popped her ugly head in to see my accomplishments as they shattered into pieces under their own weight. Minecraft offers the same sort of appeal as Legos without the nasty clean-up and inevitable three days of locating errant pieces with your feet. The world consists of an invisible cubic grid, and most objects found in the game can either fit into this grid or combine into other objects or mechanisms that you can build with. Gravitational force shows up every now and then like a know-it-all friend, offering horrible advice–“I think that pile of sand should come down here!”–or unexpectedly dropping a flow of lava on your head, then laughing hysterically as you lose your supply of rare diamonds, tools, and the blocks you spent the last three hours harvesting, but for the most part it stays out of your way so you can build your dream castle-slash-mansion-slash-dungeon-slash-pornatarium a hundred meters above the surface of the earth. Each new game randomly generates a world full of specific geographical features–mountains, deserts, oceans, forests, etc–animals, monsters and other dangers, and minerals for you to mine. Beginning with nothing, I set myself immediately to the task of ripping down a nearby tree with my bare hands, then shredding the log into planks to build a crafting table, which let me work with some real tools. From then on, the game makes a little more sense, although not much. Different tools work best for different jobs; the axe cuts wood better than stone, while the shovel digs dirt, sand and gravel better than the pickaxe, etc. Unfortunately, after about three days of playing I realized I didn’t need anything except a strong pickaxe since the shovel and the axe managed to dig dirt and chop down trees only a little more effectively than a slice of watermelon (or any other random object found in the game). And since tools degrade over time until they shatter, the watermelon has thus far proven more effective. The game offers a simple tutorial, but otherwise the player has to figure out their goals on their own. It doesn’t take long to figure out that you need to dig to find better minerals to make stronger tools that can mine the stronger minerals, all the while dumping the pile of stuff you pick up into whatever grandiose object you chose to blight the landscape with by making. It really amounts to an experience akin to building with Legos, except instead of searching through a giant tub of blocks, you search though the heavens and the earth, hoping to find whatever you need before something explodes behind you, emptying the contents of your pocket onto the ground and sending you to some random location to respawn in hopes of not getting too-lost before the time limit expires and your stuff vanishes from the game forever. As I enjoyed Final Fantasy XII more than most games, I played through it once with a completionist mindset. Once I had collected every trophy and found almost every item, I turned my sights toward the Wyrmhero blade…only to get an hour into the fishing minigame before I realized, “I have no reason to ever use this sword.” I had destroyed every challenge in the game. A super-sword would have no benefit other than a useless trophy. I went on to the final boss battle barehanded, hoping to salvage some shred of challenge. I hadn’t experienced this feeling again until I realized the futility of Minecraft. Sure it kept me busy, and I sunk a lot of time into it, and yes, having my own flying castle satisfied me…much in the way that watching Indiana Jones satisfies my desire to travel…but I just couldn’t justify continuing in a game where I could accomplish all the major challenges within a few hours. Only the monsters and natural dangers offer any real degree of challenge, but since the game doesn’t focus on combat, they would fit in just as well in Sim City, Katamari, Trauma Center, or Wheel of Fortune. 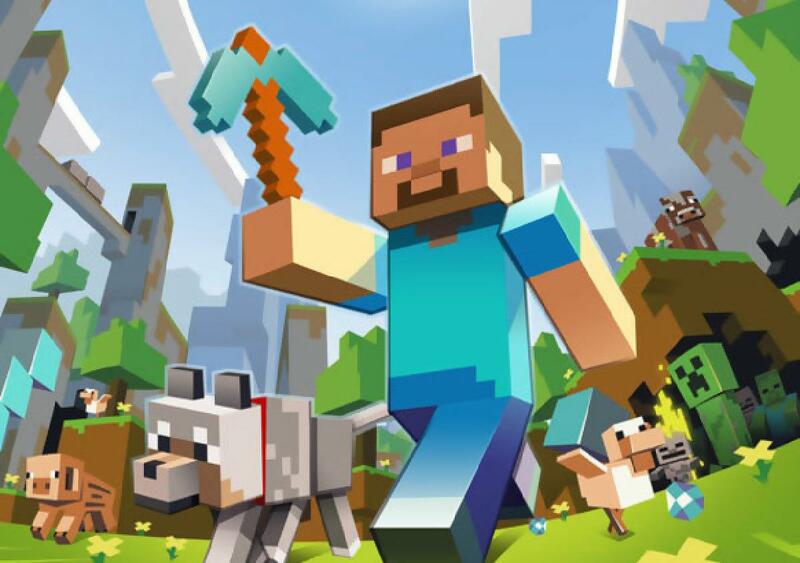 Several platforms have versions of Minecraft, each one of them slightly different from the others. I played primarily on the PS3, but also checked out the Raspberry Pi edition, while Anne spent some time getting killed on the Mac version–that’s right, in addition to natural game dangers, online players have to worry about minor wars destroying all their accomplishments. We agreed that the PS3 played the easiest, since using a console controller limited the concentration we needed to devote to complex coordination tests–and also the Pi edition has no feature to save your progress…kind of a theme with the game, I’ve noticed–but you may have noticed this review lacking pictures. Apparently the developers of this game, which fosters creativity, didn’t feel the need to include a function to take screenshots, so it won’t let you record in malleable form any progress you happen to make despite the game’s best efforts to ruin you. While I usually search for images online to insert in my posts, the only thing that pops up are the accomplishments of those who can take screenshots. Google it for yourself. I don’t need to root through their pictures for you. Honestly, the game has the best of intentions and a unique concept (although the pathetic inclusion of combat aspect kind of ruins that concept), but one other aspect not only breaks the camel’s back, but crushes the camel and grinds its viscera into the sand beneath it: inventory management. With a limited number of inventory slots and a maximum of 64 items per slot (only if it lets you stack them), you quickly find yourself with half a planet’s worth of material in your pockets. Storage chests don’t offer a lot of relief, and pretty soon you notice yourself spending half the game just collecting, moving, sorting, and looking for all the items you’ve already collected. Just like in Fallout 3 and Fallout: New Vegas, the game offers over a hundred hours of play time, but less than half of that feels fun, while the other half makes me feel I would use my time better by cleaning my apartment. The game does give a sort of unexplained sense of satisfaction, but has some issues to work out. For starters, the list of bugs and glitches–including the randomly corrupting data files for anyone who plays split-screen–don’t really belong on a console game, and shouldn’t have seen a PS3 release until they could iron those out (save the glitches for PC games, guys!). Other than that, yes, theoretically the game has an end boss, but without orienting itself toward combat, you really can’t claim any achievement other than that you’ve hollowed out an entire planet. This entry was posted in Minecraft, PC, Mac, Android, other non-consoles, PS3, XBox 360 and tagged Minecraft, PC, ps3, xbox. Bookmark the permalink.